As 2013 comes to a close, it’s time for the annual look at the top ten most popular stories of the year here on Hover Motor Company according to Google Analytics. I actually went to nearly 100 events this year, so the ones that turn up on here were especially popular. I was also happy to see that one of my history pieces turned up on the list. And for our new car fans, an auto review even cracked the top ten. I had a great time putting all of these stories together, and the numbers show that you guys are really supporting the site. Thanks for everything you do, and I hope you stay with us in 2014. What's new at the KC Classic Auto Display in Lenexa? As much as I have been enjoying working on all these new car reviews lately, I still need to look at old cars once in a while. But since it just snowed here in Kansas City, it’s not likely that we’ll be going to any car shows any time soon. 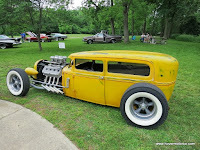 Luckily, there are places like the KC Auto Display in Lenexa where you can go check out old cars no matter the weather. So that’s just what we did recently. Most of these cars are for sale; some of them are just being stored. But there are some really interesting things hiding in this industrial, warehouse-style building. My 10-year-old son has a December birthday, and we usually throw a party for him. But instead of asking for presents, I am very proud to report that for the past five years, he has asked his friends to bring canned food items instead of gifts. Last year, he collected a record 442 items. This year, he shattered his own record with 674 items! People are really getting behind his efforts, and he gets a good feeling from taking his donations to the St. Vincent DePaul food pantry each year. Some of the best places to go look at old cars in the Kansas City area during the winter are at the dealerships that specialize in them. This week, my dad and I went down to Warrensburg, Mo., and checked out the inventory at Happy Days Dream Cars. The selection was a little light because they recently sold several of their cars at the Mecum collector car auction in Kansas City, but that doesn’t mean there weren’t several interesting things to look at. Let’s check out a few of the cars that could be yours come car show season. The joy of car shows is often a result of hanging out with friends and talking to people about your car. But if you really like looking at other peoples’ cars, and aren’t as much into the social aspect, one of the best car shows in Kansas City turns up twice a year in Bartle Hall. The December installment of the Kansas City Mecum auction was last weekend. Where else can you see 700 cars, all in top, ready-to-sell condition, parked without the restrictions of ropes and stanchions? From an automotive standpoint, there are few car shows that can top this around here. And if you bring your checkbook, every one of these vehicles has the potential to go home to the highest bidder. You’ve seen me complain about the lack of winter car stuff to do around Kansas City before. Well, this year, I’m doing something about it. Wednesday night I joined the ranks of swap meet merchants at Dale Wilch’s Man Cave, a 15,000 sq/ft treasure trove of car parts and other eclectic junk located near the Fox 4 Television studios. Once a week, Kansas City’s car community converges on this eerie underground lair, buying parts, sharing stories, and just spending time in one of the only places that never gets colder than 70-degrees. Make no mistake; the Cadillac ATS is a world-class sports sedan. Sure, it’s easy to dismiss it as just another Cadillac, but don’t let the familiar looks fool you. If you’re in the market for a BMW 3-Series and you don’t test drive an ATS, you’re not doing yourself any favors. Take this 2014 ATS 2.0T Premium that I had the opportunity to drive last week. Not only was it a great running and handling car, but certain aspects of the styling were beyond expectations. Most of us enjoy the Christmas season, but if you live in Kansas City and you like looking at old cars, cabin fever can easily set in. It would sure be nice to have a first-class car museum here in town right about now. And if the folks with the Kansas City Automotive Museum have their way, that scenario will happen sooner than later. No, there is no museum yet, but these guys are serious about making it happen. They’ve been raising money and awareness for the past couple of years, and as it turns out, progress really is being made.